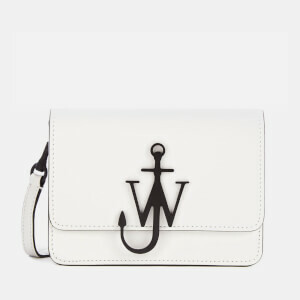 Mini cross body bag from JW Anderson in smooth red calf leather. Boasting a fold-over flap construction with a magnetic snap closure attached to the underside, the flap lifts to reveal a compact, suede-lined interior. An external slip pocket to the reverse features. Suspended from an adjustable strap that can be detached to form a clutch bag. Polished gold-tone hardware throughout including an oversized appliqué logo at the front. Tonal stitching. Protective dust bag included. Dimensions: H: 11cm x W: 18cm x D: 5cm. Strap Drop: 50cm.